Start scratching beneath the surface and you’ll find that there are as many customs as there communities. Not all weddings follow the western formula. And even though there is a predominance of white when it comes to what the bride wears, there are other countries that incorporate customs that are quite different from ours. Traditional Albanian weddings are rather epic – they begin seven days before the ceremony. They also involve a traditional bride-groom dance in which all the family and friends get involved, during the course of which everyone gives them money or attaches bank notes to them. There is also a cute custom involving the bride’s shoes, which the groom brings filled with rice and candied amonds. Bhutan’s King, Jigme Khesar Namgyel Wangchuck, recently married Jetsun Pema. The ceremony was broadcast live in a country that had no access to either TV or the Internet until 1999. Interestingly, the country uses a ‘gross national happiness’ index as a measure rather than gross national product – a good reason to get married here. Visitors are charged a daily $250 to visit Bhutan. You’ve got to really want to visit. Often the groom will need to offer gifts to the family of the bride – wine, wood, money, goats, oil, cash – and if they like them, the family will bless the wedding. Usually the bride’s father decides on how much the marriage payment is. After the ceremony, the bride returns home where she is cleansed and covered with camwood and then ‘handed’ to her husband. Red seems to play a pivotal role in Chinese weddings, it apparently represents love, joy and prosperity. Not only is a Chinese bride sometimes presented to the groom’s family in a red wedding carriage, but the bride and groom exchange red hankies on which there are mandarin ducks, because they remain together (the ducks, that is), and wish one another good luck. 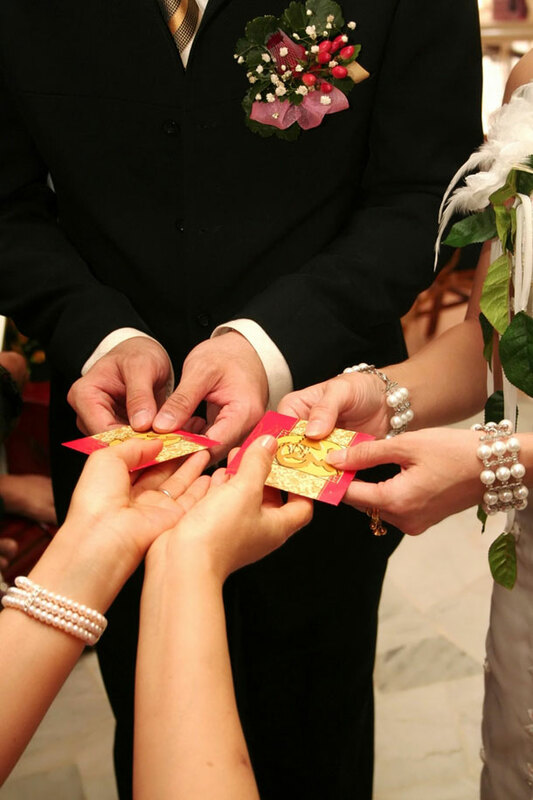 Money gifts to the bridal couple are also given in red envelopes.